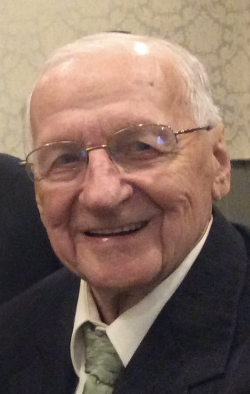 John J. Caron, 90, of Lowell passed away peacefully Tuesday, November 20, 2018 at his home surrounded by his loving family. He was married to A. Patricia (O’ Hare) Caron, who survives him, and with whom he celebrated their 65th wedding anniversary this past May. Born in Lowell, MA on November 19, 1928, he was a son of the late Joseph and the late Mary (Shea) Caron and graduated from St. Patrick’s Boy School and Lowell High School. A veteran of World War II, John proudly served his country in the US Navy. John was employed by General Electric for over 40 years which later became Vulkor Corporation. Among his many interests were horse racing, trips to Foxwoods and Mohegan Sun as well as attending his grandchildren’s many school and sporting events. John was a super-duper handyman and inventor that everyone went to when something needed to be fixed. Besides his wife, he is survived by his two sons, John J. Caron Jr. and D. Michael Caron both of Lowell; two daughters, Ann Marie Murphy and her husband Kevin and Patricia Myers and her husband Barry all of Lowell; and a sister, Ruth Upton of Palm Coast Florida and sister in-law Marie Sherman of Lowell. He also leaves seven grandchildren, Joshua Lach of San Diego, CA, Joseph Lach of Lowell, Kevin T. Murphy and his wife Carolyn of Newton, MA, Matthew Myers of Grafton, MA, Bradley Myers, Erin Myers, and Sarah Myers of Lowell as well as several dear nieces and nephews. He was predeceased by his three sisters and their spouses, Mary LaRiche, Alice and Eddie Zaniewski, and Claire and Joe Dowling, along with his in-laws Bob Upton and Roy and Anne Stewart. Relatives and friends are invited to attend his Funeral Mass to be celebrated Monday morning November 26, 2018 at ST. MARGARET OF SCOTLAND CHURCH in Lowell at 10 o’clock followed by Committal Prayers at St. Patrick Cemetery Chapel. E-condolences/directions at www.odonnellfuneralhome.com. Arrangements by the O’DONNELL FUNERAL HOME – Lowell. (978) 458-8768. Mike, So sorry to hear of your father's passing. My deepest sympathy to you and your family at this difficult time. Sincerely, Celeste Place Pacht In case you've forgotten, I knew you from Notre Dame de Lourdes CYO.